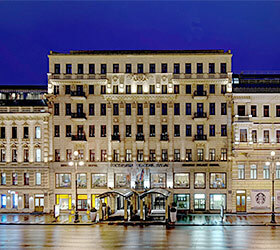 The Corinthia St.Petersburg Hotel is located in the centre of St.Petersburg on Nevsky avenue. The hotel opened in 1993 is a result of the renovation of two historical 19th century buildings in the heart of St. Petersburg. The main building overlooking Nevsky avenue, the city's principal avenue, was designed in neo-classical style and built in 1861. The second building, built in 1834, faces Stremyannaya street and was previously owned by the Samoylovs, a family of actors famous for their work with Alexandrinsky Drama Theatre. Retaining its classical 19th century facade, the interior of the hotel was completely rebuilt. All he major historical monuments including the Hermitage, St.Isaac's Cathedral and the Admiralty are nearby and easily accessible from the hotel. The hotel offers accommodation in 281 rooms and Suites provided with air-conditioning, minibars, direct international phone connection, satellite television (18 international and 6 local channels), bathrooms with hair-dryers, sprinklers, smoke detector system, safes. Standard rooms (149 rooms) offer single and double accommodation. They have a writing desk with an armchair, a lamp, a large bed or two standard beds. Smart rooms (15 rooms) are the same size as Standard rooms but have extra amenities. Each Smart room is equipped with a mini-office. It includes a desk, a fax machine, a functional lamp, a printer, and an ergonomic office chair. The hotel offers 21 Suites. Each of them consists of two rooms - a bedroom and a living room. The top-rank Presidential Suite is located on the 6th floor of the Corinthia Nevskij Palace Hotel. Being the most spacious room in the hotel, it consists of two bedrooms, a living room and a dining room. The Suite is decorated in walnut, marble, crystal and gilt. One of the special features of the Presidential Suite is a small kitchen and a bar station, which can be used to arrange a small reception or a cocktail party with the assistance of the hotel staff. The hotel has three restaurants and a cafe, each in their own distinct setting. The Landskrona restaurant offers fine dishes of European cuisine complemented with exquisite wines from France, Italy, Spain and other countries. The Imperial restaurant is known for its Sunday Jazz brunches with live music and champagne. The Beerstube restaurant offers Austrian and German cuisine and beer from around the world. The Vienna cafe on the lobby level of the hotel is one of the most celebrated coffee and teahouses in St. Petersburg. It offers a wide selection of blends and varieties to choose from. The following facilities are also available for guests of the Corinthia St.Petersburg Hotel: conference and banquet halls, two-level parking, event arrangement, excursion service, tickets booking, a fitness centre, a beauty parlour.